*thinks again....really hard.....* Maybe I should make another picture of Zim...? On 3 now everyone... 1, 2- AWWWWWWWWW!!! *gets blown away by the awww* I SAID ON 3 NOT 2!!! u know i think it's because of jiss remember the part in the story where she went running around like a insane commando person killing all the Irken soldiers + the human slaves and she stoud there laughing zim was so sad he cried AAAAAAAAAAAAAAAAAAAAWWWWWWWWWWWWWW! aww...^^ zimmeh is so cute. you did a great job on this... awwwwwwwwwwwwww!!!!!!! adorable! +++faves!!!! Heh no one broke up with him. I just drew it cause it's soo CUTE!!! QUTE!!! 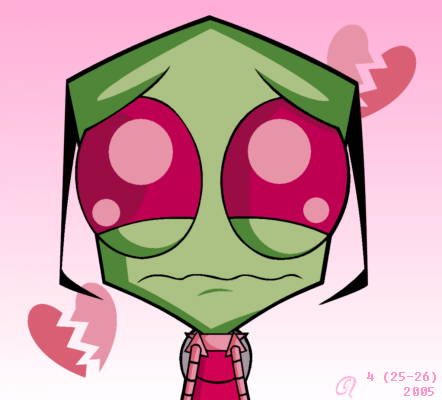 Who broke up with Zim?!? I'll show them a thing or two, messing with Zimmy's heart....GREAT PIC!!!! aawww...... so underneath that hard shell is a soft side... dont ever be afraid to show your true self.